NLL commissioner Nick Sakiewicz appeared on Lax Sports Network earlier this week where he mentioned that the league is in discussions with at least 25 markets about expansion, including several which are serious possibilities. With it his goal to expand to 16 teams soon, and with the success of the Saskatchewan Rush, the present seems like a possible time it could occur. The question is, which 25 markets are NLL viable? In the past few months, there has been more and more talk about NHL owned teams, teams in markets supported by other sports teams, and potentially smaller arenas such as Saskatoon and New England. Here are some guesses for some markets, and arguments as to why they might work. Possibly the most obvious option and the most discussed. Philadelphia had been the most successful NLL market before relocating before the 2015 NLL season, and ever since there has been talk of returning. Last year, there was speculation of the lacrosse camps company NXT possibly being involved in the management of a team. Early on in his tenure, Sakiewicz cited Edmonton as a priority market for the league to return to. The city may have a team as soon as 2018, and the team would play at Rogers Place, and hopefully have NHL affiliation, according to Sakiewicz. Pittsburgh has been attempted twice, yet remains one of the most discussed possibilities of American markets. The steel-city hasn’t been mentioned much in recent years, but was always brought up as a target market when former commissioner George Daniel discussed American expansion. Another former league market, there have been two preseason games in Montreal in recent seasons. Calgary general manager Mike Board talked about Montreal as a possibility for expansion, and Sakiewicz has mentioned them. Winnipeg has been a hot topic ever since the success of the Jets of the NHL. Playing in a small, intimate arena like the MTS Centre, it almost seems like the perfect, Saskatchewan-like market for the NLL. Sankiewicz has mentioned that Winnipeg is on the league’s radar. Nashville has been one of the worst kept secrets in lacrosse for years, with talks of interest from the Nashville Predators that trace all the way back to 2012. With Nassau completely empty after the relocation of the New York Islanders, it might be a great opportunity for the NLL to take advantage of a strong lacrosse community on Long Island with an unused stadium. Calgary COO John Bean has mentioned Long Island as an expansion possibility. Ottawa, like Montreal, has been oft-discussed for a Canadian market to make a return to pro lacrosse. The league played a pre season game there in December, and it’s no secret that it was to test the market for regular season games. The Verizon Wireless Center at the center of Manchester seems like it would be a perfect arena if the NLL wants to go back to smaller stadiums. With a team in New England already, it might be a reach, but the lease would be low without many tenants and New Hampshire is nearly a four hour drive to Connecticut. San Jose or Oakland could be possibilities. San Jose has happened before, but if the Sharks could get on board, could be a terrific tenant. San Jose has two other professional sports teams in the Sabercats of the Arena Football League and the Earthquakes of Major League Soccer, and are proven to support smaller sports leagues. While Columbus did not succeed, the Gladiators of the Arena Football League and Monsters of the American Hockey League have had success at Quicken Loans Arena. Both are owned by Cleveland Cavaliers owner Dan Gilbert, and adding an NLL team to that arsenal would be logical. The Milwaukee Wire made a solid case for Wisconsin to have an NLL team, though concludes it might not make total sense for the league at this point. Panther Arena would be the best bet, since the NBA’s Bucks don’t seem open to having other sports tenants in their arena. Detroit is getting a new arena for the Red Wings, and nine dates a year for an NLL team could only add to bringing in more fans. Little Caesars Arena will be ready in 2016, hosting mostly the Red Wings and college basketball. Adding nine nights for an NLL team would be simple. 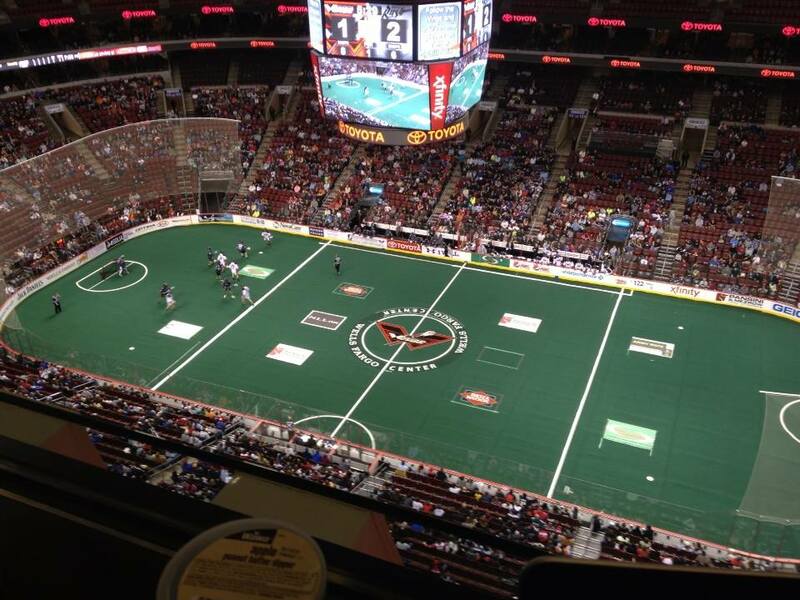 Another oft-discussed market for the NLL. Sakiewicz mentioned Quebec City as a market he would be interested in expanding to. The Sprint Center has seen arena football and college basketball, but isn’t used often. Kansas City has three pro sports teams, including Major League Soccer, where Sankiewicz has ties. There was also once a pre season NHL contest in the arena which had a sellout crowd. Lacrosse has not had much of a presence in the midwest, so there would likely need to be multiple teams. KeyArena doesn’t have any current major sports tenants, but it was ruled unfit to be an NBA arena. This is a market where MLS ties can be involved again with the Seattle Sounders, who have found tremendous success. The NLL has been in the state, with the Washington Stealth moving from Everett to Vancouver. With a new Arena Football team in town, and a good arena, the NLL making a return to the mid-Atlantic would have its best option in Washington. D.C was mentioned by Sakiewicz in passing when discussing close market proximity as a positive for the NLL. With the success of Real Salt Lake in Utah, and and EnergySolutions Arena being the home of the NBA’s Jazz, Utah can be a pro sports market. The mountain region has seen success with lacrosse, as seen with the Denver Outlaws and Colorado Mammoth, so a Utah team could be a natural rival for the Mammoth and have a better western presence for the NLL in America. Texas has been a growing lacrosse market, with MLL no doubt expanding there in the near future. This would be a longshot, but getting Mark Cuban, owner of the Dallas Mavericks involved, would be tremendous. Sakiewicz has stated he would like to have more teams in the south. New Jersey had the Storm, but has never been considered a real expansion possibility. The Devils are in New Jersey, and the New York Red Bulls of MLS play in the state, which again, Sankiewicz has a connection too. If Philadelphia doesn’t succeed, or Long Island, New Jersey is another option in the tri state area. In 2011, a pre season game was attempted in Trenton. With the chance of the NHL and NFL in Sin City in the near future, why not an NLL team? When the Swarm were moving, they were on the shortlist. George Daniel mentioned Las Vegas years ago, so the city has been on the league’s radar in the past. If the Wild could have ownership again, Minnesota would be a good place to return to. Attendance was never bad and there was a loyal fanbase. The teams were bad in recent years, which hurt ticket sales, but an expansion team, especially with NHL leadership, would be welcomed back in Minnesota. London and Hamilton have been mentioned several times, and the league has seen Hamilton before with the Ontario Raiders, which later became the Toronto Rock. The Rock would have to approve of another Ontario team, and the league has a presence in Rochester and Buffalo as well, but Ontario has by far the most dense box lacrosse fan population. With the loss of the Rams, the city of St. Louis might be welcoming for a new team. The St. Louis Blues of the NHL are a huge success, and the Scottrade Center has no other tenants with no NBA team either. With Blues ownership, it could be a good option. The Lightning are a smashing success at Amalie Arena, and the NCAA hockey championships was recently hosted there. Florida has seen the NLL before with the Orlando Titans, which lasted just a year, but a fanbase in Tampa Bay might be worth a shot if the league does want to expand south.